By Cynthia Graber and Nicola Twilley. Discovered by Player FM and our community — copyright is owned by the publisher, not Player FM, and audio streamed directly from their servers. For most of us, eggs are perfect packets of portable protein, and pizza is the lazy option for dinner. For the research team at the U.S. Army Natick Soldier Systems Center, pizza and eggs are two of the most nightmarish food-science challenges of the last fifty years—but the struggle to perfect such dishes for the military has shaped civilian meals, too. Join us this episode as we venture into the Willy Wonka-style labs where the U.S. Army is developing the rations of the future, and then take a trip to the supermarket with author Anastacia Marx de Salcedo to see how military R&D has made much of the food on our grocery store shelves longer-lasting, more portable, and convenient—and, yes, more highly processed too. In her book, Combat-Ready Kitchen, Anastacia Marx de Salcedo credits the ancient Egyptians with some of the first real military rations: little cakes made from barley, onions, and some dried, salted fish. For millennia, food on the battlefield remained more or less the same, because preservation methods barely changed. Napoleon’s Europe-conquering ambitions inspired the first big leap forward in rations in thousands of years: canning. But, although it was invented in the early 1800s, canned food remained so expensive and slow to produce that fifty years later, during the American Civil War, cans were still only found in the officers’ rations. In the twentieth century, civilians moved on, embracing refrigerated and frozen food. In the military, however, where packages of food have to last for months—even years—at ambient temperature, the can remained king until 1980. 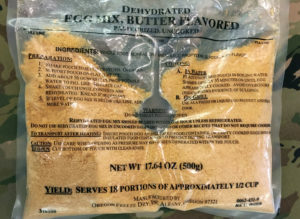 Its replacement was the MRE, a flexible foil pouch filled with pre-cooked, ready-to-eat meals that was the outcome of decades of R&D by the food scientists at the U.S. Army Soldier Research, Development & Engineering Center in Natick, Massachusetts. Today, that pouch can be found in pantries across America, holding everything from juice to tuna. 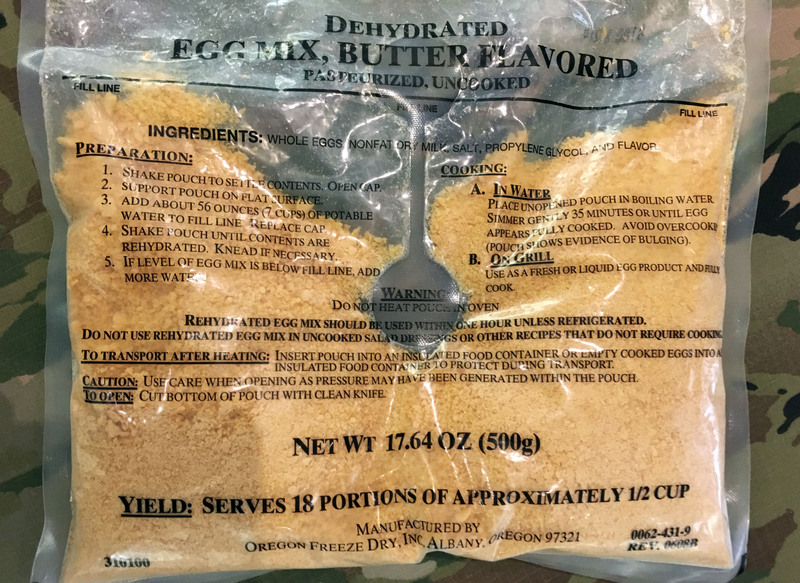 But even the pouch couldn’t solve the Army’s egg problem—indeed, the soldiers’ nickname for the veggie omelet in a pouch was the “vomlet.” This episode, we try the military’s next-gen eggs—so cutting-edge they haven’t made it into the ration rotation yet—while we explore the high-tech science required to make lightweight, long-lasting, and at least somewhat tasty food. And we find out why military food matters—both on the battlefield and on the home front. Listen in now for more. 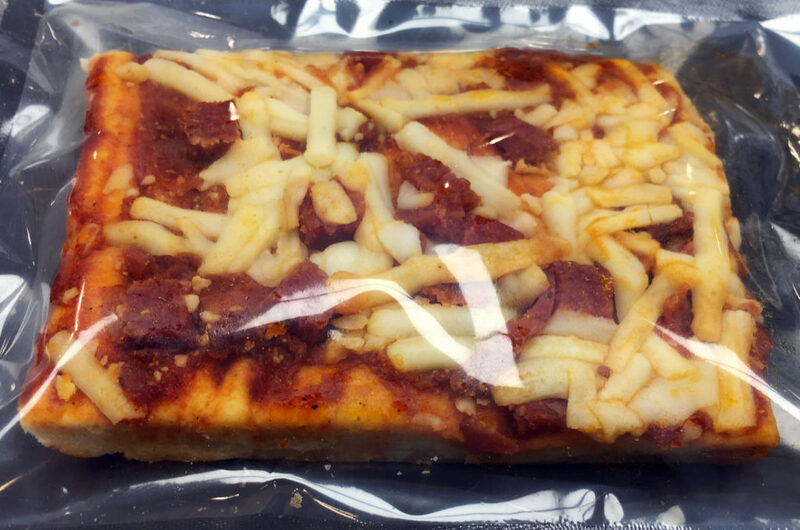 Michelle Richardson’s ration-ready pizza. All photos by Nicola Twilley. The U.S. Army Natick Soldier Research, Development and Engineering Center is part of the U.S. Army Natick Soldier Systems Center in Natick, Massachusetts. 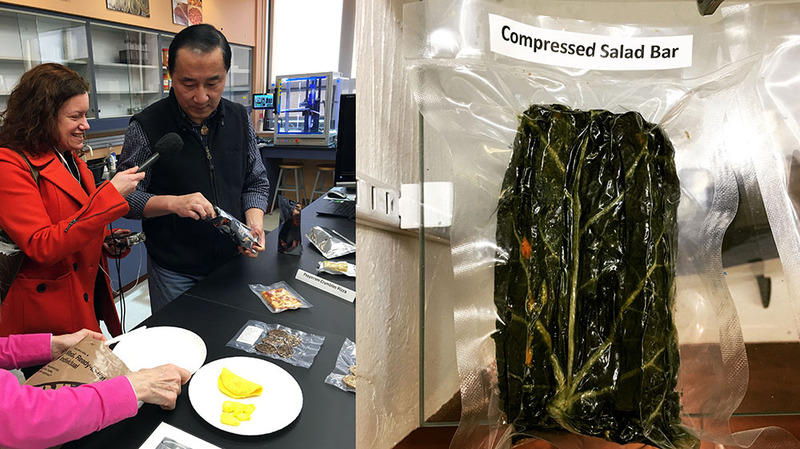 The Natick team of scientists, engineers, technologists, and equipment designers are responsible for equipping warfighters with clothing and armor, shelter, and, of course, food! Cynthia and Tom Yang—the next-gen eggs are on the plate in front (L); Tom’s latest creation is the Compressed Salad Bar (R). David Acetta heating his MRE using the flameless ration heater (L); David’s buffalo chicken MRE, before he added the buffalo sauce (R). 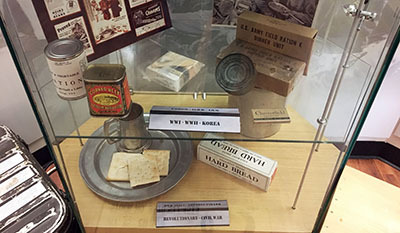 Revolutionary War and World War II-era rations in the Combat Feeding historical ration display at Natick. Anastacia Marx de Salcedo is a food writer and the author of Combat-Ready Kitchen: How the U.S. Military Shapes the Way You Eat. The post Marching on our Stomachs: The Science and History of Feeding the Troops appeared first on Gastropod. 138 episodes available. A new episode about every 15 days averaging 47 mins duration . Eating to Win: Gatorade, Muscle Milk, and… Chicken Nuggets? Who Invented Mac and Cheese? Start listening to Gastropod on your phone right now with Player FM's free mobile app, the best podcasting experience on both iPhone and Android. Your subcriptions will sync with your account on this website too. Podcast smart and easy with the app that refuses to compromise. Food Non-Fiction tells the incredible true stories behind food. We delve deep into the history and fascinating facts about the most famous and interesting foods. We look forward to taking you on this wild food journey, through history, and around the world. Welcome to The Dinner Party Download, a fast and funny hour of culture, food and conversation: “public radio’s arts & leisure section.” In every episode you’ll learn a joke; bone up on an odd bit of history and then wash it down with a themed cocktail recipe; meet artists of note; have your burning etiquette questions answered; savor an emerging food trend; and hear your new favorite song. Plus, unconventional wisdom from hosts Rico Gagliano and Brendan Francis Newnam. Serious Eats' podcast Special Sauce enables food lovers everywhere to eavesdrop on an intimate conversation about food and life between host and Serious Eats founder Ed Levine and his well-known/famous friends and acquaintances both in and out of the food culture.